Home>First Flint, Now Newark - Are You Next? First Flint, Now Newark - Are You Next? Just 16 miles from our home at Hackensack University Medical Center is the city of Newark, NJ. It is the state’s largest city, with more than 285,000 people calling it home. According to the 2010 census, more than half of the people who live in Newark are African-American, and more than a quarter of its inhabitants are under the age of 18. It is the state’s second-poorest city and recent revelations indicate the water of Newark, NJ is rife with lead. More than four years since the start of Flint, Michigan’s own water crisis, we’re currently facing one in our own backyard. That doesn’t make it a more pressing problem to us than the ongoing one in Flint (which is still not resolved), it just means that even more innocent people in another large, largely poor city have been exposed to a known health threat that officials neglected to fix, and in some cases denied was happening at all. At the end of October, top officials in Newark finally admitted what many people knew or had suspected for a while: measures taken to prevent lead from leaching into drinking water were failing at one of Newark’s two treatment plants, according to the results of a new engineering study. This negligence – and in some cases, outright lying - on the part of people elected or hired to keep residents safe has put every single resident at risk, but especially the city’s children. The city is now urgently giving away 40,000 water filters, which is really more of a symbolic gesture at this point than any sort of true solution. As I have mentioned in previous posts, and according to the National Institutes of Health (NIH), the health effects of lead exposure in children are well-established, scary, and numerous. Lower blood levels of lead can cause reduced IQ and attention span; learning difficulties; behavioral issues; delayed puberty in boys and girls; and decreased hearing. Higher blood levels of lead in children have been associated with abdominal pain, convulsions, and loss of voluntary muscle control. There is no safe blood lead level for children. Despite the health consequences, there are practical remedies to help rid the body of lead and assist in the healing process. If you fear your family has been exposed to lead in the home, at school, or elsewhere, there are steps you can take to try to reduce blood levels of lead, especially in kids. The U.S. Centers for Disease Control and Prevention (CDC) offers an online manual with helpful tips such as cleaning up any lead dust around the home, washing hands and toys often with soap and water, and using duct tape to cover chipping or peeled paint. Another great way to try to combat the effects of lead exposure is through nutrition. Foods high in calcium, iron and vitamin C may help keep lead out of the body and help remove lead that is there already, so choose nutritionally-dense foods high in these vitamins such as milk, cheese, leafy greens, peanut butter, oranges, and beans. Flint’s ongoing water catastrophe has highlighted the dire need for infrastructure upgrades to public drinking water supplies in cities around the country such as Newark, but also places like Milwaukee and Pittsburg, which, according to a Vice.com article published earlier this year, are facing potential lead-in-water crises of their own. In the face of all of this, you can be proactive to protect your family, and take their health into your own hands. 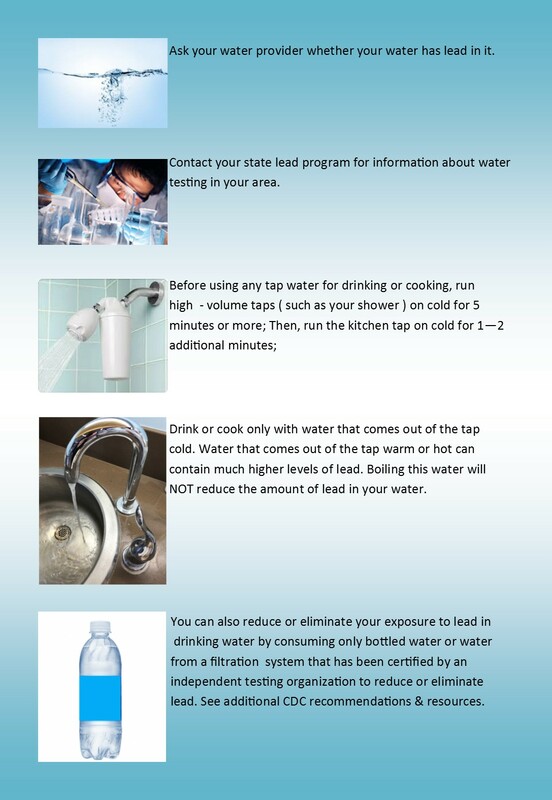 The CDC recommends the following steps below to decrease exposures to lead in drinking water. The Environmental Protection Agency (EPA) and the Centers for Disease Control and Prevention (CDC) agree that there is “no known safe level of lead in a child's blood. Lead is harmful to health, especially for children.” To learn more about lead in drinking water and what you can do, click here. EPA acting administrator Andrew Wheeler has said reducing lead exposure, particularly among children, is a top priority at the agency. You can provide input to the President’s Task Force on Environmental Health Risks and Safety Risks to Children by sending an email to FedLeadStrategy@nih.gov. Share an experience, report lead exposures, offer ideas for how to prevent these kinds of disasters from happening again.